This is not the same game as the SPI version and has a completely different game play, although it covers the same story. I have found that there are two versions of this game. One was a bagged version (1976) and one was boxed (1978). As far as I know, they are the same except the packaging. The bagged version just comes with a board with the cover artwork printed on the back side of the board. In fact it is the same picture that ended up on the boxed version. I dont have a copy of the Boxed version, so I dont know if there were any changes to the rules, but from what I have read elsewhere the bagged version is the same. The map on the board is also the same for both versions from what I have seen. The artwork for this game is very simple, although the map looks very nice. The artwork for the counters is very simple with just a listing of the Combat Strength (1, 2, or 3) and <?xml:namespace prefix = st1 ns = "urn:schemas-microsoft-com:office:smarttags" />Province of Origin (Dol Amroth, Barad-Dur, etc). For the individual units, the Nazgul has a big N, and the Hobbits have a big H with the name of the hobbit below (there is only three!! ), etc. The One Ring gets a big O with the big word RING under it. The rule book has almost no artwork, just a couple of drawings of the counters, and a Fantasy Games logo. It took me a long time to get this game. It goes up for bid on ebay every once in a while and usually goes for quite a bit of money. I dont know how many games were published, but it must not have been very many based on the frequency of the auctions and the price that they go for (usually over $200). I have only recently gotten the game, so I have not had a chance to play test it yet (like so many of the games I have gotten lately), but I will do my best to describe the actions of the game. The rule book is about 13 pages long in a 8.5 x 5.5 inch size. I will paraphrase it as best as I can. More at the end of this review on what I think of the game, but first you have to learn how the game is played. Game play. 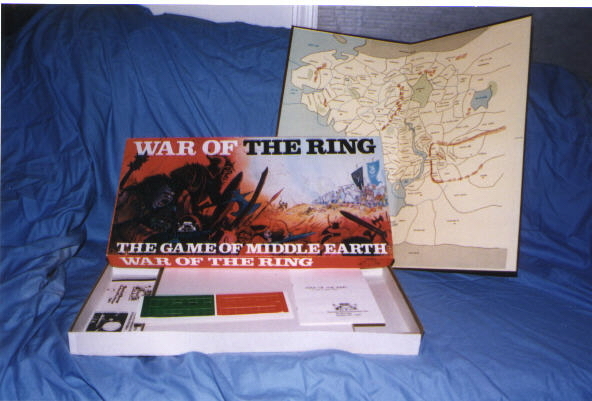 War of the Ring is designed to simulate the conflict between the Fellowship of the Ring and Gondor on one side, and the Forces of Mordor on the other. This game is played in two levels. First it is a strategic maneuver game that can lead to a minor victory, or to set up conditions to the second level. The second is the attempt by the individuals of the Fellowship to move the ring to Mount Doom while evading the forces of Mordor (including the Nazgul) without it being captured. The game can be played by two to four players. Each side can be handled by a single player, or the individuals and Nazgul may be moved by a second on each side. The board is divided into provinces designated by black lines. The names of the providences are listed in each. Water provinces are in blue, including the Anduin River. The Western Sea is also broken into Sea Provinces where Fleets can be deployed, a unique feature to this game that is not used enough in other games. The Northern Wastes and the Far Harad are out of bounds and are gray. There are mountain chains throughout that can be passed by some characters, but not others like armies. The armies are broken down into three types: Single (1); Double (2); and Triple (3) Armies as designated on the face of the counter. Armies cannot be stacked and only one unit per providence. Each army must control at least one supply province in order to exist. These are marked by stars. Mordor has black stars, Gondor has green stars, and uncommitted provinces have brown stars. Before I explain the rules, the rule book tells how to play the game after the Victory Conditions, at the end. An odd place to list how to play the game, so I will move that function up to here and mention that the game is played by writing down the orders on a piece of paper prior to following the steps presented below. Each player writes down the move for each of his units (with a unit designation) and describes Unit Moves (Province Leaving and Province Entering), Support in place, Support attack, Build Fleet, Hold, Mutual Hold, and Build a New Army. You cannot order a unit more than once (of course there are some exceptions to this like Mutual Hold and Support), or if an order is ambiguous and cannot be clearly understood in context of the order, it is cancelled (I would think there should be someway to fix this so this does not happen, but that is what the rules say). Battles frequently consist of a chain of smaller battles (A attacks B, B attacks C, C attacks D, etc.). The way to resolve this is to find the end of the chain (the army which is attacking but not being attacked) and start from there. This may result in a cancellation due to subsequent reactions to other battles. Retreats, if possible, occur after the battles are resolved and necessary adjustments are made. The turn is completed after this. In any one turn, an army may do one and only one of the following: Move, Give Support, Attack; Build a Fleet. To move, an army may move one province per turn to any adjacent unoccupied province. An army may attack an enemy unit in an adjacent province. The mechanics is very simple. The army with the bigger number wins (ie. A 3 beats a 2, or a 2 beats a 1). The losing army retreats to an unoccupied by another unit, but cannot retreat into non-friendly supply provinces or off the edge of the board. Except for Gandolf or Strider, units may not retreat in the Withywindle. However, if a weaker force attacks a stronger force, it will weaken the stronger force. Example, if a 1 unit attacks a 2 unit, the 2 unit after the attack will become a 1 unit limiting its abilities. The attacking unit retreats. Adjacent armies may also give support to a province but must be adjacent to the attacking province. Support is cut, if that support province is attacked. Armies may also build a fleet to be used along the coastline. They are converted by armies adjacent to the coast. The fleet may be converted back to a land army at any time and support other provinces in attacking an enemy province. Fleets can also be used to go up the rivers Tolfalas and the Anduin (up to the rapids at Sarn Gebir). Other fleets may be built for use on the upper Anduin, but are restricted only to that area and cannot go past the rapids. Retreats: If a unit is attacked by a more powerful unit, it is dislodged and must retreat into an adjacent province that is unoccupied by another unit. If the attacker is weaker than the defender, the attacker must retreat back to the province from where it started. If a second friendly unit has been ordered to that same province, that order is cancelled. If a unit is forced to retreat, but cannot, it is destroyed and removed from the board. If a double army is destroyed in a supply province, and a new army is formed, it will only be a single army unit. If an individual (Ill get to that in a minute) like a Nazgul is destroyed, there is no replacement and are removed from play. In addition to army units, there are Individual units like the Nazgul (N), Frodo (H), Strider (S), etc. They have no military power, but may aid in combat based on special abilities. They may also combat each other. There is a list of the special abilities for each of the Individuals. Gandolf has a quasi-military power of 4/3. If he joins a Single (1) Army unit, he brings the strength size up to 2-1/3 (1 + 4/3), or rounded out, 2 helping either with attacking strength or defensive strength. The Nazgul have a quasi-military power of 1/3, and if two team up with a Single (1) Army, the strength is also brought to 1-2/3, or rounded to nearest number, 2. Individuals may coexist in the same province and may ride in friendly fleets and aid the coexisting army if they have that ability. Hobbits and the Ring: The hobbits start in the Shire, of course, and are allied to Gondor. They can move one province per turn (other individuals may move two provinces, but since hobbits are small, they travel slower). There are no markers for them on the board. They are recorded using a pencil and paper. If any hobbit (considered to be invisible due to their size) is captured by a Mordor unit, the recorded movements are transferred to the Mordor player and the hobbits are now invisible to the Gondor player. Hobbits move under their own power when controlled by Gondor. They move with the army units or Nazgul when controlled by Mordor. The Mordor units are always on the lookout for the hobbits. Only a Triple (3) Army unit or a Nazgul can tell if the Ring is present if it is within the same province. The Nazgul can only detect the Ringbearer, and not the other hobbits. Hobbits are only found when not protected by a friendly army unit in a province. If a hobbit is captured and the capturing unit (military or Nazgul) is attacked and forced to retreat, the hobbit escapes and returns to the Gondor units. If a province is attacked that contains a hobbit and the units are forced to retreat, the hobbit may stay with the Godor unit, or go to another adjacent province. Gandolf, Strider, or any Gondorian Double (2) Army may put on the Ring and become a Ringlord and achieve extra powers. A Double (2) Army becomes a Triple (3) Army. If Gandolf or Strider put on the Ring, they become a Double Army while still retaining their other characteristics (moves two provinces, etc). A Ringlord is visible to Mordor. The Ring must be in the same province with a unit before it can put on the Ring. Once put on, the Ring may not be removed unless the Ringlord unit is destroyed, at which time the Ring may be captured. The Ring has other possibilities such as being sunk at sea to get rid of it from play. The Ringbearer may drop it in a sea province. A destruction of a Ringbearer Fleet results in the sinking of the Ring, however, Mordor has a chance to recover the Ring if a Triple (3) Army Fleet is there, or a Double (2) Army Fleet with a Nazgul. Gondor may also recover the Ring with a Double Army Imladris, Double Army Lorien, or any other Double Army with Gandolf or Strider. Victory Conditions: There are several ways to achieve a victory. Two of these gain 2 points for the winning side, the others only 1. The game ends when 1) The Ringbearer (not the Ringlord) gets to Mt Doom  2 point victory for Gondor; 2) The Ringlord (not the Ringbearer) gets to Barad-Dur  1 point for Gondor; 3) Mordors Triple (3) Army is destroyed  1 point for Gondor; 4) The Ring is captured by, or delivered to, Mordors Triple (3) Army  2 point victory for Mordor; 5) Gandolf, Strider, Double (2) Army Imladris, and Double Army Lorien are destroyed  this is a 1 point victory for Mordor. This game has some very different game mechanics from other games at the time which are primarily hex board war games with probability combat charts and terrain charts. The orders are written down secretly and revealed at the beginning of the turn. Another review that I read for this game, made it sound like a simple my army unit is larger than yours, so I win this battle, but in reality, it is a little more complex than this. Strategies can be used such as using a smaller army to attack a larger army. Sure you will loose that battle, but the effects on the bigger army may delay it from performing a different task that may be to your advantage. I do like the fact that there are two levels of game play going on at the same time. One is the movement of the armies for occupying provinces, but at the same time, you have individuals performing other secret tasks, like destroying the Ring, or some other tactic. I also like the fact that all of Middle Earth is at your disposal. 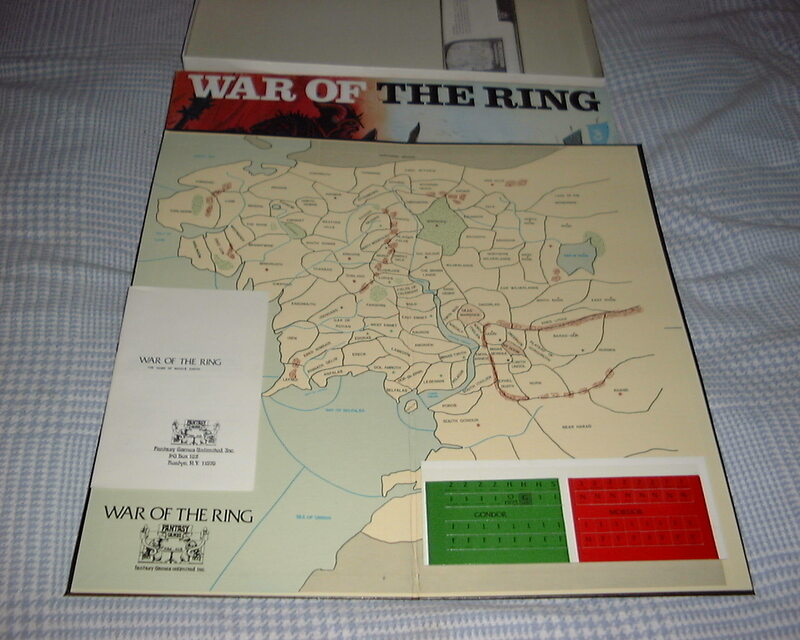 While you can use the traditional Lord of the Rings story line to play the game, this game also looks at the fact that the Ring could have gone west to the sea and moved south to Gondor instead of trekking through the mountains and risking attacks from huge Orc armies. There are no true magic elements to this game other than giving the heroes more abilities than the regular folk. I look forward to trying out this game.